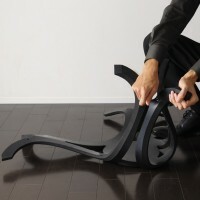 The Japanese design studio h220430 have created a stool made of rubber. Regarding the rubber, which has been widely used for a long time, a research and development of rubber is moving forward with a progress of the material science. Now, the artificial synthetic rubber becomes popular and plays an active part in this field. On the other hand, a demand of natural rubber keeps expanding since natural rubber is better than synthetic rubber in terms of its physicality and cost. This enlarges a large scale of rubber tree planting, and environmental destruction due to a deforestation become worse mainly in Southeast Asia. Although to use recycled rubber is proposed as one of the approaches to improve this circumstance, this approach is not progressed. 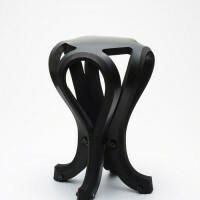 We designed a stool made by recycled rubber taking this situation into consideration. 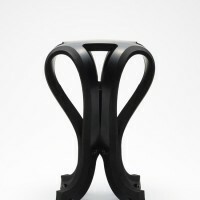 Although a framework of this stool is simple with just bending one piece of rubber plate and holding legs with bolts, a form of this stool is unimaginably elegant and comfortably cushioned with elasticity of rubber. This stool can be stored in a small space by rolling up when it is not in use. We hope that this Rubber Stool is widely used as one of the usage of recycled rubber and it would be a trigger that people realize the circumstance of deforestation for making rubber. 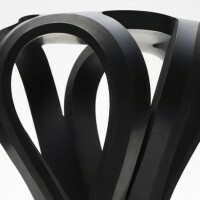 Visit h220430 Design Studio’s website – here.